call me obvious, call me cliche, call me midnight in paris (don't do that)..but i'd like to revert to a different time period. because really, all this distraction...how am i to be? the internet equally fogs and blows my mind. netflix. craigslist. instagram. eventually finding myself watching strangers' wedding videos. how am i to turn into the person i'm supposed to be while i'm tearing up watching strange people's beautiful and kitschy wedding videos!!!!? i wish to revert back to 90s era maybe. not too far back...not in a time where brussels were boiled and corsets were commonplace. the 1990s, technology-wise, sound pretty good. my head would be freer. my brain would blossom more as my own. house phones only, with 2 lines. bonus: n'sync. also in the 90s cupcakes hadn't yet been ruined by cupcake stores. and a tangy creme fraiche topping that breathes pleasant new life into a cupcake. preheat oven to 350 degreesF. grease 2 muffin tins or line with cupcake papers. combine flour, baking soda, and salt in a bowl, and whisk to combine. 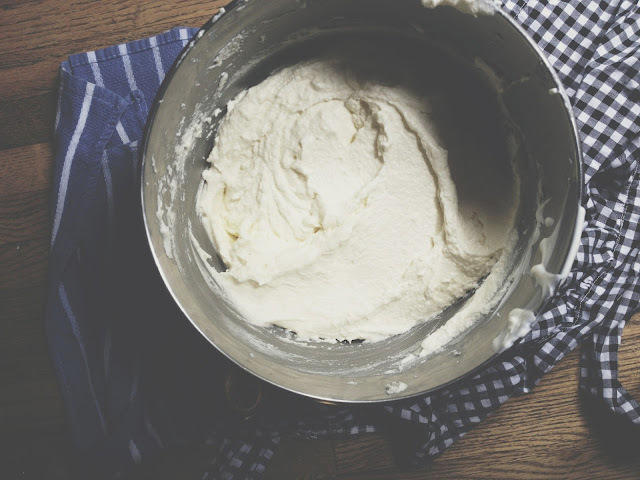 cream the butter and sugar in the bowl of an electric mixer for a few minutes until light and fluffy. reduce speed to low and add the extracts, then the eggs one at a time, beating for a minute after each addition. stir in the sour cream. then add the dry ingredients and mix until just combined. 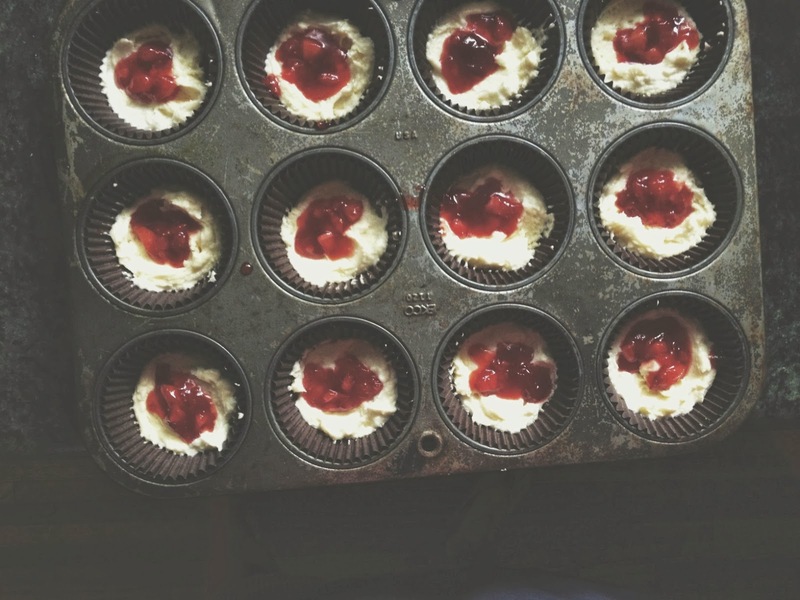 place a spoonful of batter into the bottoms of each cupcake liner. then add a spoonful of preserves in the center. finally top each one off with another dollop of batter, making sure to cover the preserves completely. each liner should be about 2/3 full. bake for 20 minutes, or until a tester comes out clean. let cool on a wire rack. for quick strawberry preserves, dice up some strawberries, about 1 cup, and throw them in a small saucepan. add some sugar, around 1/4 cup (more or less depending on sweetness of your berries), and a small squeeze of lemon. some vanilla bean is a nice touch too but completely optional. stir to combine and then let them melt over low-medium heat. their juices will release and boil. let cook and bubble over the heat for about 5 minutes, and then cool.